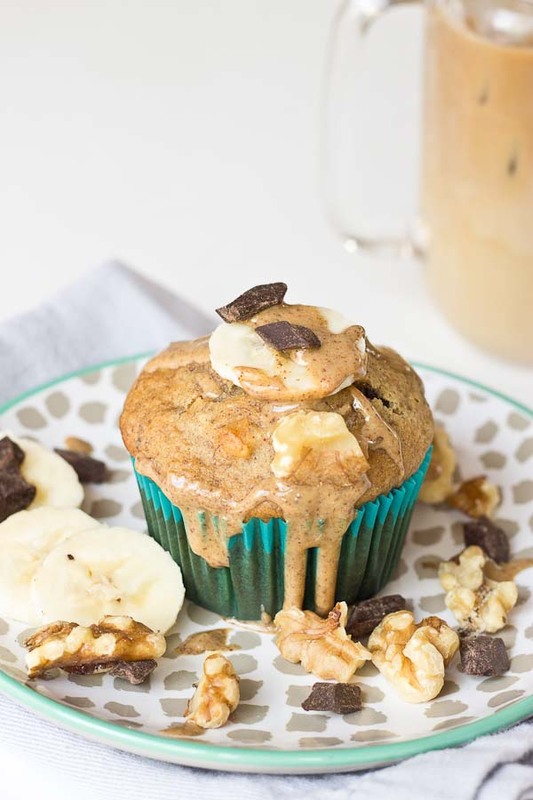 These Almond Butter Banana Bread Muffins are so moist and just straight up YUM! I’d highly suggest whipping yourself up a batch of these healthier banana bread lower carb muffins this weekend! Coffee. Y’all, I really love coffee. Iced coffee to be real. It’s HOT and who wants to drink a warm cup of joe this time of year? There are many reasons that I cherish coffee and I wake up every morning thankful that I love it so much. It’s honestly the highlight of my morning – there’s something special about that first sip of liquid gold before the rest of the fam wakes up. It’s the perfect mid afternoon pick-me-up when I’m already worn out from the day. When there are busy mornings with nutrition counseling client meetings, getting the baby to sleep and finally getting to my computer to do all.the.things really quickly before he wakes up, coffee is ALWAYS the involved. Putting my PJs on as soon as I got home and all I want to do is sleep while the baby sleeps. Coffee is most definitely an essential. And if you really want to know what work mom life is like, it’s this video. 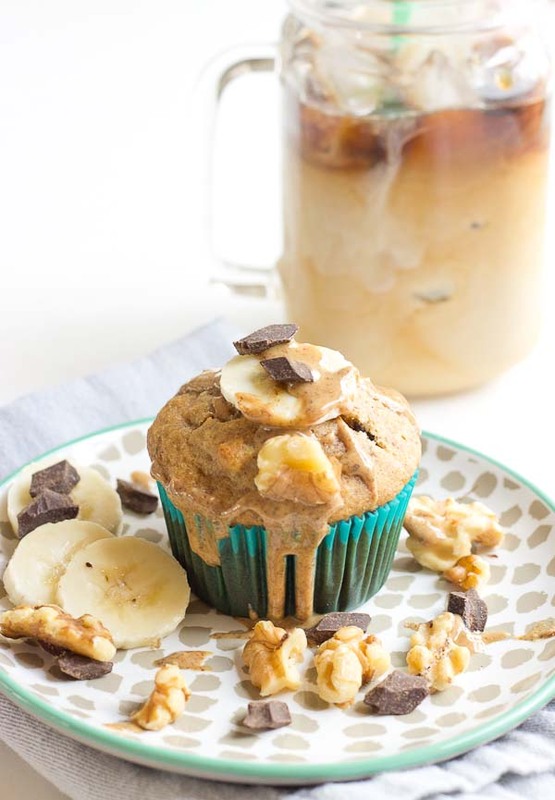 Because hot coffee is a luxury item, we just stick to iced coffee and Almond Butter Banana Bread Muffins. The combo is actually unbeatable! You need to try these gluten free, lower carb muffins ASAP. They’re made with a whole lotta chocolate AND they’re gluten free muffins. Butter is a great substitute for this recipe! Measurement is one-to-one ratio if substituting butter for coconut oil when making these gluten free muffins. How to make banana muffins? 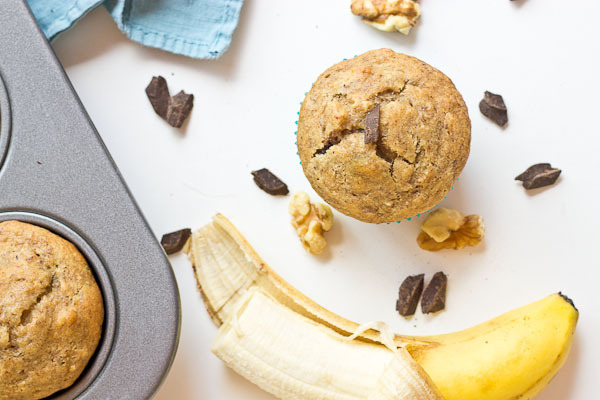 The secret to making the very best gluten free banana bread muffins is to use super ripe bananas – I’m talking about bananas that are basically black. They’re sweeter and also make for a super moist and fluffy banana bread muffin. It definitely takes patience and a little planning to create the perfect banana bread muffins but it’s oh so worth it. 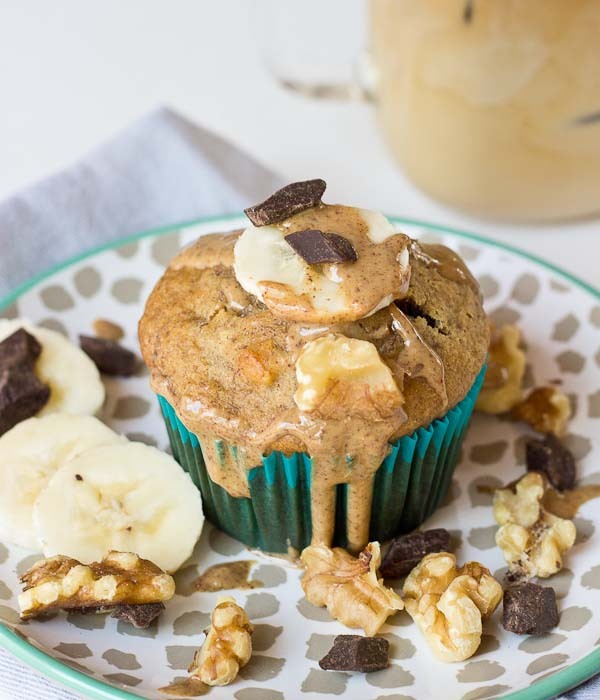 Pure heaven is the best way to describe these very best Almond Butter Banana Bread Muffins! 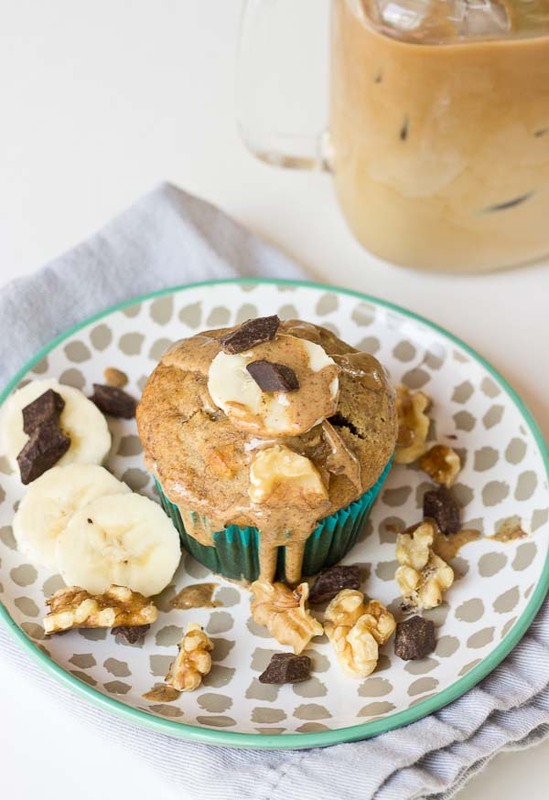 These Almond Butter Banana Bread Muffins are made with clean and nutritious ingredients that you can feel good about eating. The coconut oil and almond butter provide 7g of healthy fats per muffin! Naturally sweetened with honey and super ripe bananas, these gluten free muffins are only 6g of sugar per serving – WOWZA! I should also mention that these are lower carb muffins with just 13g in each muffin. I don’t know about you guys but it’s like searching for a needle in a haystack when it comes to finding a decently low carb muffin these days. That’s partially why I concocted this recipe along with the fact that I love anything that has to do with banana bread. Ya with me? My mom makes THE BEST traditional banana bread with allllll of the buttery and sugary goodness. 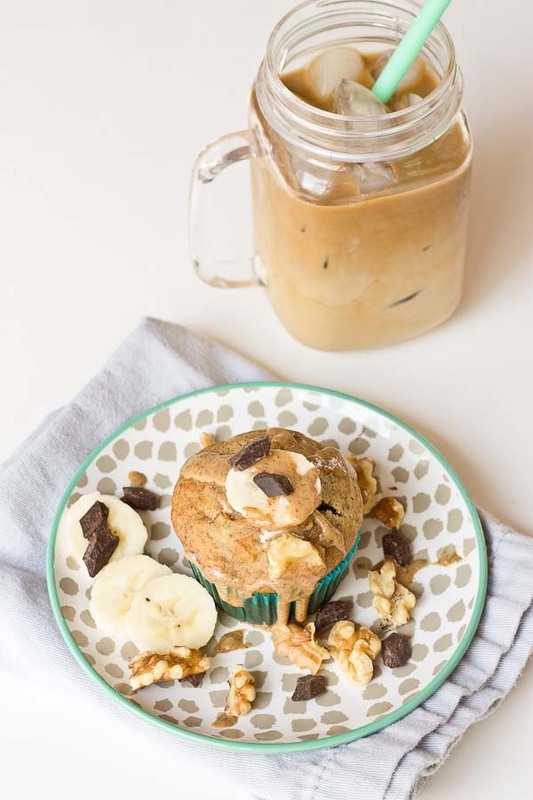 This Almond Butter Banana Bread Muffin recipe is my healthier spin on her traditional recipe. I guess you could say I’m a lover of muffins – blueberry, lemon poppyseed, chocolate, banana nut… but nothing beats these guys! Lower carb, low sugar, healthy fats – I’m in! 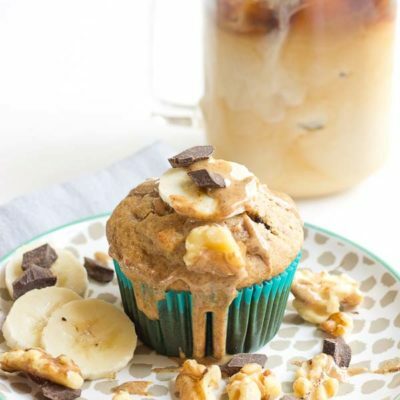 These Almond Butter Banana Bread Muffins are so moist and yum! 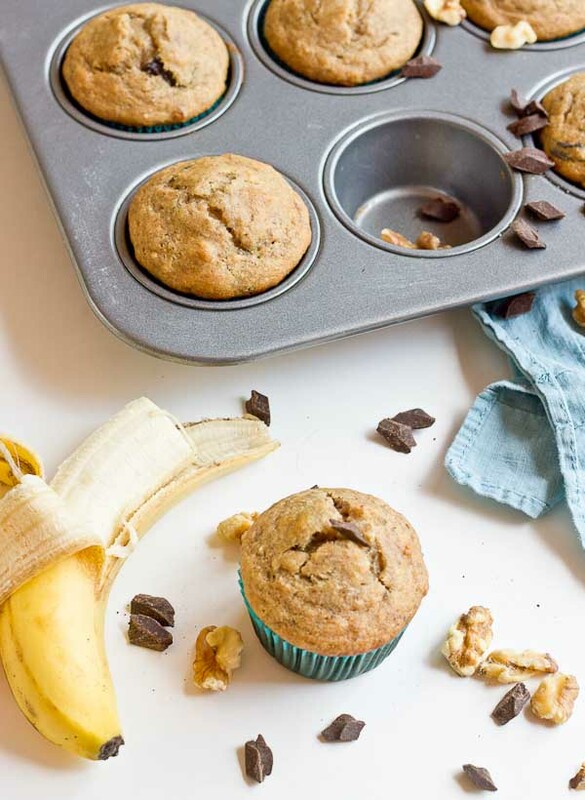 Whip up a batch of these healthier banana bread muffins this weekend! Preheat oven to 350 degrees F. Line 24 count muffin tin with paper liners. In large bowl, whisk together eggs, bananas, coconut oil, almond butter, and honey. Stir in almond extract, baking soda, salt, and baking powder. Spoon batter into muffin tin and bake for 25 minutes. You could definitely use melted butter! YES!! I’m dying to try a good iced coffee from the grocery store. I’ve tested out the new Starbucks iced coffee and I was pretty disappointed. (they added a preservative and you can really taste it!) ick.